“Won’t You Be My Neighbor?” isn’t really a biopic of Rogers; instead, it’s a portrait of one soft-spoken man’s ideas, which were both simple and deeply profound. Rating: 3.5 stars out of 4. If you were a small child in the late ’60s or later, you probably grew up with “Mister Rogers’ Neighborhood.” And, if you are one of these people (we are legion), and you watch Morgan Neville’s new documentary “Won’t You Be My Neighbor?,” you are probably going to cry, maybe even a lot. I’m just warning you in advance, as it’s not always easy to wipe your eyes on a popcorn bag. “Won’t You Be My Neighbor?” puts “Mister Rogers’ Neighborhood” in cultural context; it’s fascinating to ponder how his show, with its modest sets, handmade puppets and homespun morals, ran in the complete opposite direction of other children’s television of the time. (Nothing on “Mister Rogers” was animated; nothing ever seemed zippy or loud or fast.) 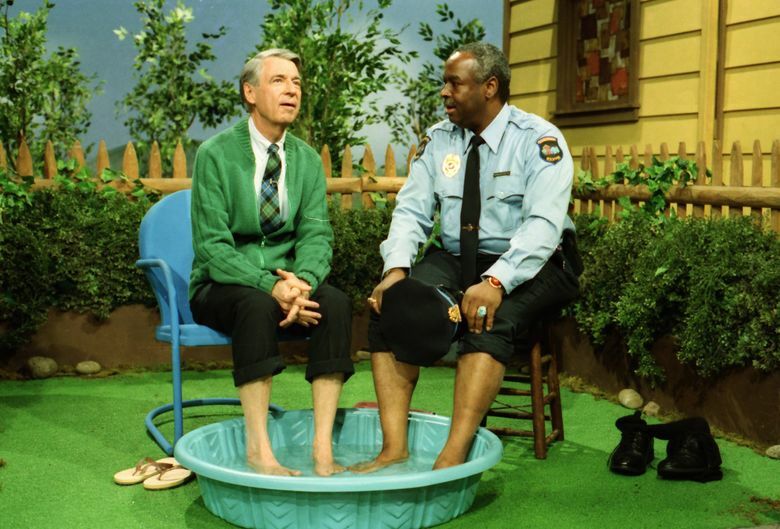 We’re reminded of how Rogers quietly made a civil-rights statement on his show, back in 1969, by companionably sharing a wading pool on a hot day with Officer Clemmons, who is black — at a time of segregated pools in much of the country. And we’re told that he was no saint — he struggled to accept that Clemmons, a friend off-screen, was gay — but perpetually strove to do better, which was all he asked of us. Watching this film took me, and I suspect many of its viewers, immediately back to early childhood and to the Neighborhood, where Mister Rogers reminded us, in gentle song, that we were special and that he liked us as we were. Fred Rogers is gone and the world is a much scarier place; this film, like a gift, briefly transports us back to the calm we felt long ago. Maybe we’re crying because of that lost innocence; or maybe because there’s a part of us that still misses the man in the cardigan, who always promised that he’d be back tomorrow. ★★★½ “Won’t You Be My Neighbor?,” a documentary directed by Morgan Neville. 93 minutes. Rated PG-13 for some thematic elements and language. Multiple theaters.